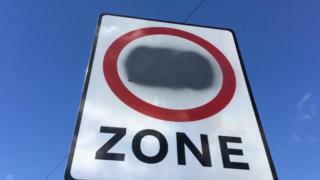 Council workers were forced to cover up new speed limit signs with spray-paint - after realising they should never have been installed. The 20mph notices were erected last week in Littlefield Lane, Grimsby, before a public consultation on the new restriction had ended. They were hastily painted over on Wednesday after the error was reported. North East Lincolnshire Council said its partner, Engie, was responsible for the premature signage. A spokesperson for the firm said: "Engie would like to apologise to residents for the errors we have made on the Littlefield Lane road safety improvement scheme and any inconvenience caused. According to Grimsby Live, 26 new posts advising motorists of the new speed limits were installed on both sides of the road. The mistake was also greeted with derision on social media. One person wrote: "I assume they'll fine themselves for graffitiing then." Others took a more pragmatic approach. Someone asked if those responsible had ever heard of vinyl stickers.